Joining Bart this month are Gazmaz from the MyMac Podcast, and Lynda Gousha. 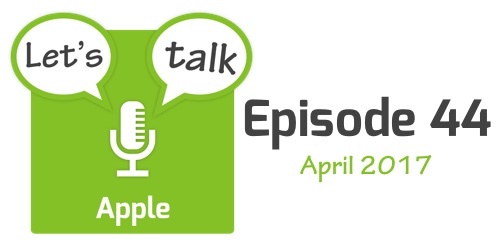 The show starts with a quick look at some Apple-related legal stories that made the news in April before moving on to look at the month’s notable Apple hirings. The four main stories are Apple’s Q2 2017 earnings call, Earth Day 2017, reports that Apple are working on an optical blood-glucose sensor, and Microsoft’s announcement of Windows 10 S and new Surface Laptop. The show finishes with a quick rundown of some other, shorter, Apple-related stories that made the news in April.